Synopsis Li Jan, a girl from Northern China, travels to Hong Kong with a 90 day tourist visa to meet with a groom, Tat, to be brought into the world of underground prostitution. On this first night, she is guided through different back alleys into different red light motels while trying to make a single phone call. As she delves deeper into the world the phone call seems beneath her grasp. 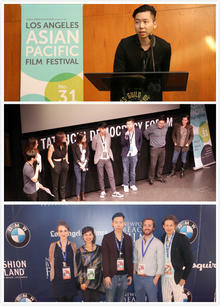 Timothy Yeung is a Canadian-born Chinese filmmaker from Toronto with a lifelong passion for the cinematic arts. During his undergraduate studies at Ryerson University, his student film "7 143" was nominated for Best Narrative Short Screenplay. After his undergraduate studies, Timothy gained valuable experience at a Toronto television station - directing and producing a food program and various commercials. After two years in television, Timothy applied and was accepted to NYU Tisch School of the Arts Asia for his Masters in Fine Arts for Film Production" Writing & Directing. After his first year, Timothy worked on the Hong Kong, China feature, “血滴子 (The Guillotines).” Once “血滴子 (The Guillotines)” completed, Timothy returned to NYU Tisch to write, direct and co-produce his next short film shot in Hong Kong “9O天 (90 Days)”. “9O天 (90 Days)”, is currently in the festival circuit and had its World Premiere at the 32nd Vancouver International Film Festival. At VIFF, it received Honorable Mention most Promising Director of a Canadian Short Film. The film also screened at the 19th IFVA and 20th Palm Springs International Short Fest where it won Best North American Short Film & Runner-Up Best Student Cinematography. “9O天 (90 Days)” recently received the Kodak Student Scholarship Program 2014 Gold Award. Timothy completed his third year at NYU and is currently working towards his first feature film which will also be his thesis at NYU. — Shared by Timothy Yeung, director of 90 Days after attending 20th Palm Springs International Film Festival & Short Fest, USA, under the sponsorship of NAE. since and we are looking to meet to discuss my next project. felt that there is a place for Asian stories and Asian voices. — Shared by Timothy Yeung, director of 90 Days after attending Los Angeles Asian Pacific Film Festival, USA, under the sponsorship of NAE.